My daughter was reading Dorothy Must Die by Danielle Paige out loud while I was driving. It’s a pleasant way to pass some time, and we are both fans of Oz and its various spin-offs. We were around Chapter 12 when suddenly she stopped to recall a scene from several chapters earlier, where a goth Munchkin by the name of Indigo had been killed by the goons of…oh, dear, I almost threw in a spoiler. In any event, she was lamenting Indigo’s death. “I really liked her,” she said. “You know why, right? Because Amy didn’t like her at first, but she grew on Amy.” Amy is the main character, and the story is narrated by her in the first person (that doesn’t count as a spoiler, right?). “That’s called POV, or point of view. Do you know what that means?” I asked. She didn’t. So I told her that the author manipulates us to see the events of the story through Amy’s eyes. So if she likes a character, we like her, too. If she fears a character, we fear her, too. Without POV, there is no story, just a bunch of “facts”. I put “facts” in quotation marks, because there are very few things that are fact, just as there is very little that is “the truth”. Yes, there is a lot of truth, but “the truth” is pretty rare. We can spend our whole lives searching for “the truth”, and many of us convince ourselves that we have found it, but authors know better. The truth is that the hawk is hungry and needs to eat a meal, and that kitten on the lawn is obviously a tender, juicy meal. Time to go grocery shopping! The truth is that the open lawn is a dangerous place, where folks are at the mercy of heartless monsters who can swoop out of the sky at a moment’s notice and gobble you up. Better run for cover! Both of those stories are truth. Neither is “the truth”. Both are stories, and the storyteller controls your mind and your perception of truth through a simple device called point of view. Storytellers control your perception of truth through a simple device called point of view. So it is, too, in affairs of state. One country’s freedom fighter is another country’s ruthless scoundrel. And what most people call “patriotism” is nothing more than holding steadfast to a myopic point-of-view, which rulers of all political stripes exploit to control their populations. If there was one thing that actually could bring world peace, it would be for everybody to try seeing things from somebody else’s point of view. But I suppose that would be called “unpatriotic”. So, too, we find point of view hard at work in the households of our planet. The single greatest cause of divorce is an unmovable point of view. If husbands and wives would truly view their differences through each other’s eyes, they would not get so angry, frustrated or accusatory. Arguments would cease and divorce would be rendered unnecessary. But world peace and marital bliss are not just around the corner, because it is really hard to change a person’s point of view. World peace and marital bliss are far off; it’s hard to change a person’s point of view. Or is it? So we have moved the point of view quite easily from Character A to Character B. We are now seeing events through Character B’s eyes. We are feeling her fear. We are seeking a way out along with her. Take another look at the paragraph above. At what point did the point of view shift? I’ll give you a moment to consider this question, while we take a short break to play some elevator music. OK, so that was not quite elevator music, but if you understand Spanish, you might recognize that Volveras is a song about the struggle between two people’s points of view. The first person narrator is telling the second person, the ex-lover, that he’ll change his mind and come back. She is saying that he will change his point of view to align with hers. Point of view is essential to all stories, even in song lyrics. Now, back to that paragraph, and to my question: “At what point did the point of view shift?” It was at the third word, the word “felt”. That is a perception word. 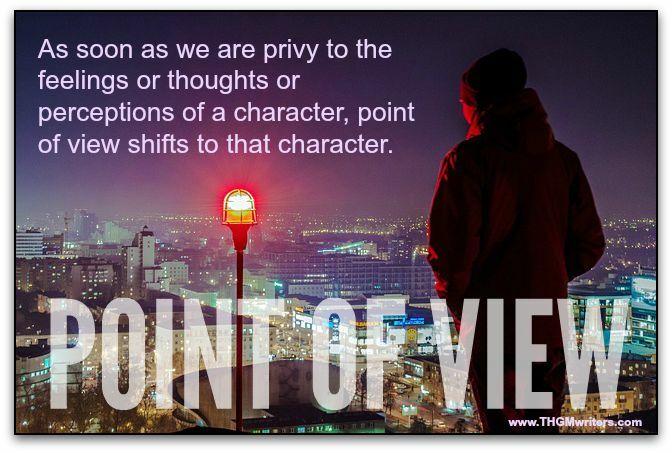 As soon as we are privy to the feelings or thoughts or perceptions of a character, point of view shifts to that character. In the original Wizard of Oz, both in the books and the various Hollywood adaptations, we follow Dorothy’s point of view. In subsequent books in the series, the point of view switches. In Dorothy Must Die, you can probably guess by the title that the point of view has changed somewhat. Some stories shift point of view several times. Others never shift point of view. If you shift point of view every couple of paragraphs, you’ll drive your readers crazy. A good storyteller changes point of view only with purpose. A clever politician never lets you change point of view. A clever politician is as good a storyteller as they come. If you write fiction, you are a storyteller. If you write non-fiction – even how-to books and business books – you are a storyteller. 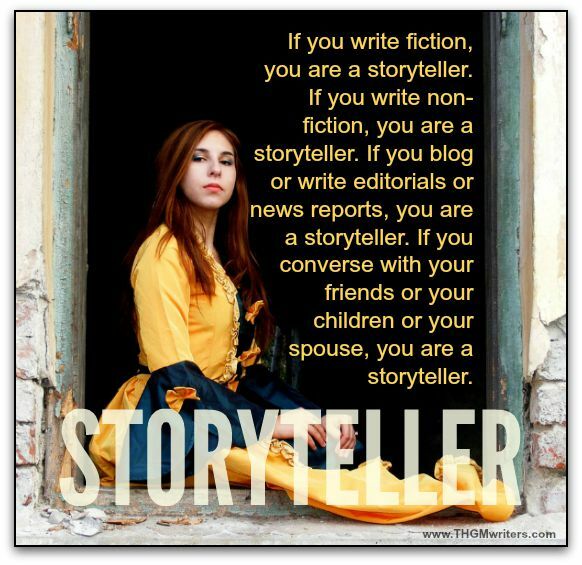 If you blog or write editorials or news reports, you are a storyteller. If you converse with your friends or your children or your spouse, you are a storyteller. So why won’t we have world peace and marital bliss any time soon? Because storytellers control their own points of view. Because people insist on perceiving things through their own senses and their own thoughts. Because we assume that the story we receive is the only truth, when all it is is point of view. Silly humans! Yes, point of view matters a lot in storytelling. Several times while reading books I have seen when the character in focus changes to a different character and suddenly we are in the shoes of someone else. We do not recognize the shift immediately, due to the flow of the story – however if read with the purpose of learning story-telling am sure we can catch those track changes. Marital bliss – that is impossible, and there is only one point of view in it – that is the wife’s!